I have fond memories of eating mini powdered doughnuts at the CNE in the summer time with my family. The CNE is just a Toronto specific carnival… but you can insert your own version of this story now! There was always a Tiny Tom’s Donuts food cart dishing out thousands of hot powdery doughnuts. So believe it or not, these vegan powdered doughnuts are just like the ones I remember. Well, they’re even better! Thanks to T-fal for partnering with me and sponsoring this blog post. 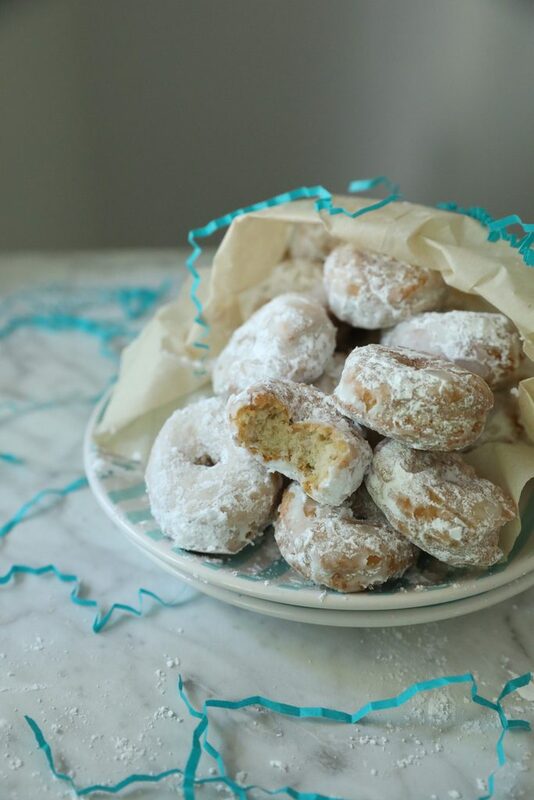 I made these doughnuts with the T-fal EZ Clean Fryer which makes deep frying at home super simple and easy. 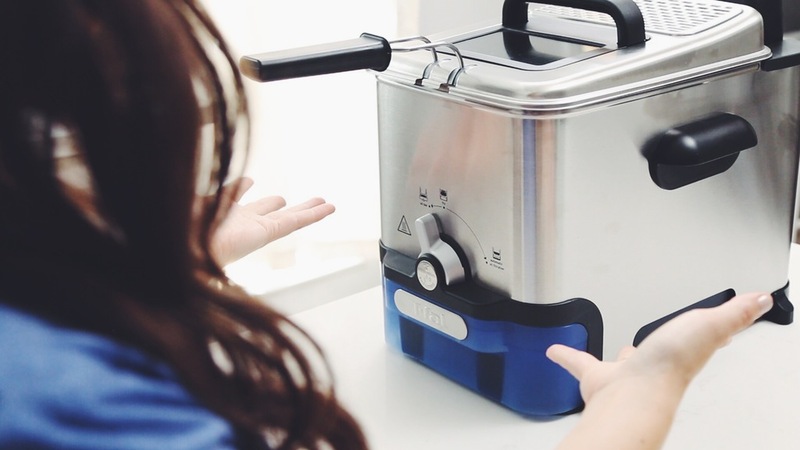 It has a feature that no other deep fryer on the market has. The automatic filtration system will drain, filter, and store the oil for future use and will do so safely when you’re done frying and the oil has cooled to a safe temperature. You just flip a switch and it takes care of the rest. You can see how I made these and how this appliance works in the video below or keep scrolling for the recipe. you can now deep fry your own mini vegan powdered doughnuts at home and they’re even better then the ones you remember getting at the carnival! Cakey, moist, sugary, and nostalgic! Heat your fryer to 360°F to 365°F on the dial. If you're not using a deep fryer then have a deep heavy bottomed pot filled with about 2 inches of vegetable oil. Attach a thermometer to the side of the pot to monitor the oil temperature. In a small mixing bowl combine the flax and water and set aside for 5 to 10 minutes to let it thicken. In another mixing bowl combine the nondairy milk with apple cider vinegar and set it aside. It will slightly thicken and curdle. In a large mixing bowl combine the all-purpose flour with sugar, baking powder, sea salt, and cinnamon. Then add vanilla extract and melted vegan butter to the nondairy milk and vinegar mixture as well as the thickened flax mixture. Whisk together to combine well. Then create a well in the middle of the dry ingredients and pour the liquid ingredients into the well. Fold together with a spatula until it comes together into a sticky ball of dough with no flour visible. Lightly flour a clean counter surface and dust the ball of dough with a bit of flour as well as your hands. Place the dough on the floured surface and gently pat it out to a smooth disc that is approximately 1-inch to 1 1/4-inch thick. Cut out 2-inch round pieces from the dough using a cookie cutter. To make the holes in the center I used a wooden chopstick. Ensure you flour it well. Insert it into the center and gentle twirl the doughnut a few times until a small hole is created. Place it back onto the floured counter and complete this with the remaining doughnuts. 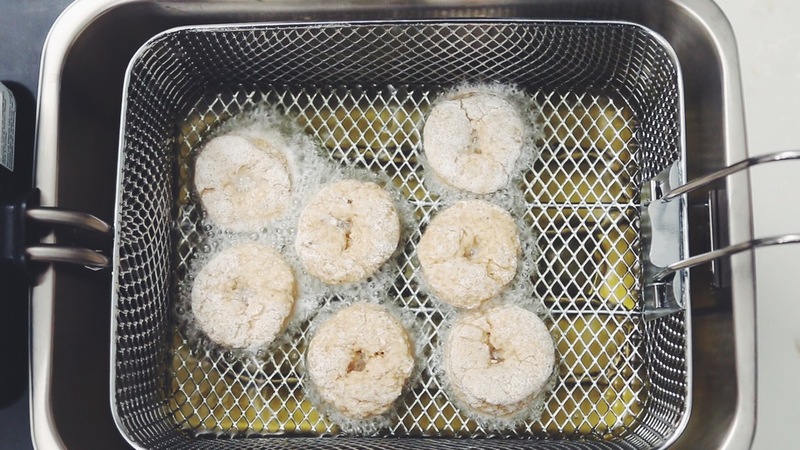 When the oil has reached its temperature place the doughnuts in the fry basket and set inside the fryer. Set the timer to 5 minutes and place the lid on. If you're frying in a pot gently drop the doughnuts into the hot oil. While the first batch of doughnuts is frying cut out more 2-inch circles from the remaining dough and create more doughnuts. If you make the doughnuts any smaller or not as thick then ensure you reduce the frying time to keep them from getting too hard. With 1 minute remaining in the frying time flip the doughnuts over with your wooden chopstick to get the other side a golden brown color. To remove the doughnuts from the oil lift and hook the fry basket on the side of the fryer or remove the doughnuts with a slotted fryer spoon from the pot of frying oil and let it sit for a few seconds to drain excess oil from the doughnuts before removing them onto a wire rack placed over a baking sheet. There's no need to set these on paper towels. They shouldn't be drenched in oil at all, unless you were frying at too low of a temperature. 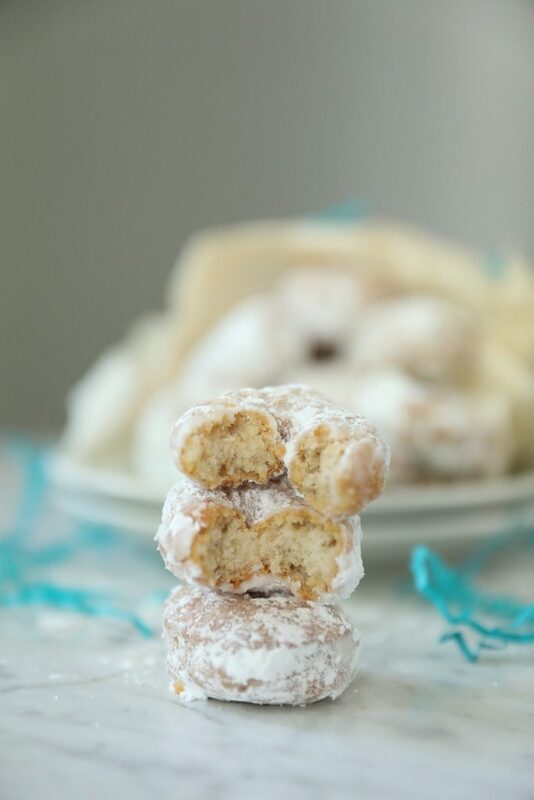 Allow the doughnuts to cool for 10 to 20 minutes before coating in powdered sugar. If they're too hot and steamy it will make the coating of sugar too sticky. 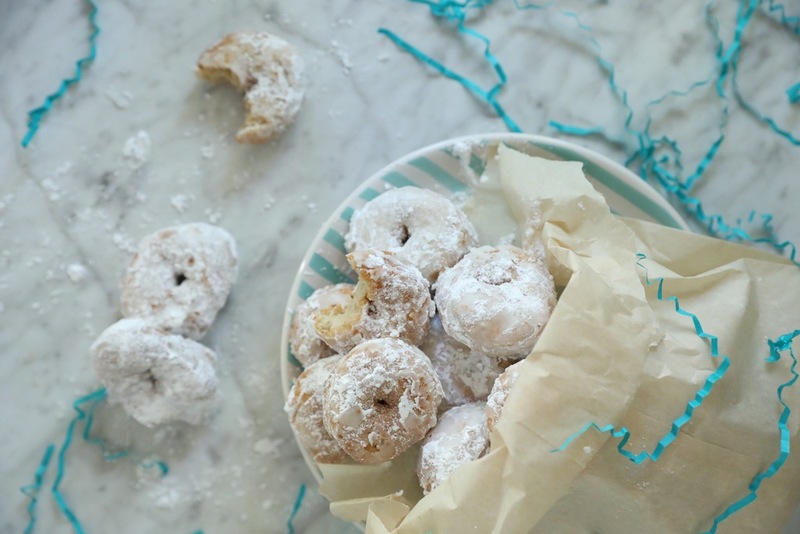 Place the powdered sugar in a parchment bag or paper lunch bag and add a few doughnuts in the bag. Shake well until doughnuts are completely covered in powdered sugar. You can either serve and eat these right out of the bag, which could be cute for a party snack, or place them back onto the wire rack or a plate and serve immediately while still warm. Just like ALL doughnuts, these are best eaten on the first day of making them! Leftovers may become a bit stale or hard.